Perfume: The Story of a Murderer is a book I’ve had on my ‘to-read’ list for some time. I started reading it with some trepidation since horror isn’t my usual genre of choice, and I was under the impression this was a particularly gruesome book. I was soon quite engrossed in this story about Jean-Baptiste Grenouille who is born in the squalidness of pre-Revolution Paris (1730s) and who has no personal odour. As he manages to survive a bleak and loveless childhood he discovers he has a ‘gift’ for smells – in that he can smell everything in the world in the most minute detail. The descriptions of Grenouille’s olfactory experiences are lush and you can almost smell them coming off the page – from the suffocating stench of overcrowded Paris with it’s oozing cemeteries, fish markets and tanneries and stinking river, to the sweet scent of all the individual flowers used to make a perfume. Eventually Grenouille ends up working for a master perfumer, learning how to distill perfumes and extract scents. I found this part of the book quite fascinating (probably my science background coming to the fore) particularly the techniques used in an age without modern laboratory facilities. Pages are devoted to describing the extraction of scents and the manufacture of perfumed oils and other accessories, and I can only wonder at the amount of research that must have gone into this subject. Far from boring, the juxtaposition of the stench of the city with the descriptions of the aristocracy wearing these manufactured perfumes is cleverly done and makes for an interesting historical commentary. Grenouille is an odd character, freakish in both physical appearance and in temperament. Aloof, disconnected from the world around him, and seemingly without any sense of social propriety or conscience he increasingly becomes obsessed with his gift and embarks on a journey to learn other techniques for extracting scents. He uses his new found skills to extract the scent of inanimate objects, creating art-like “masterpieces”. He was enchanted by their meaningless perfection; and at no time in his life, either before or after, were there moments of such truly innocent happiness as in those days when he playfully and eagerly set about creating fragrant landscapes, still lifes, and studies of individual objects. Soon his obsession reaches new heights, and eventually he begins to murder in order to possess the scent of beautiful young girls. The murder aspect of the book begins at roughly the 75% mark. 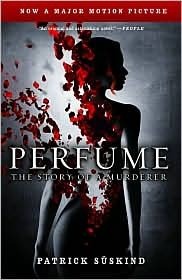 Perfume: the story of *murder* it really isn’t and my assumptions about gruesomeness or gore were totally unfounded. The book doesn’t dwell on the violence, but more on the increasingly bizarre behaviours of Grenouille and the obsessive nature of his quest to possess the scents and his ability to catalogue them inside himself. As titled, the novel is really the story of a *murderer* – Grenouille – and he is not an easy character to empathize with. While his originality and creativity are almost admirable, to be honest there’s not a lot to like here. The obsession that drives him is pretty creepy and the overall tone of the book smells like a sinister Gothic horror. This isn’t a long book and I read it quite quickly. The magical realism themes occur near the end of the book and will be a disappointment for some readers. The end perhaps is not as strong as the rest of the book, but to my mind Grenouille’s final ‘decision’ seemed a fitting end to his story. I’ve only seen the film but I agree, it IS creepy. The “protagonist” is creepy himself. But I think that’s what’s making me want to read this. I want to be able to know more about the character, to delve more on how his mind works. The mind fascinates me. There are parts in the film that turn me off; I’d like to know if I will have the same reaction when I finally read the book.